The past is always present in Cody Country. This part of Wyoming represents the last of the true West. Cody is what America was, a place where the cowboy culture thrives and where the new west begins. The vistas are spectacular, the land is wild, the people are genuinely friendly and the opportunities for outdoor adventure, recreation, education and entertainment are as large and varied as the Wyoming skies. 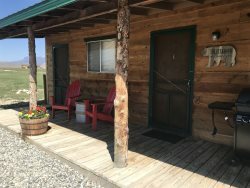 Cody Country has a well developed hospitality industry with varied lodging opportunities, fine dining, world class museums and western activities. We are the only gateway community with two entrances to Yellowstone National Park and Cody is the hub for several loop tour drives that access five different Scenic Byways. Enjoy numerous local events during your stay in Cody! From the world famous Cody Nite Rodeo, to summer concerts, fairs and festivals, and parades, there`s something for everyone! Wyoming has many beautiful things to offer. Some from day trips from Cody include a trip up the beautiful Big Horn Mountains were you can hike, fish, camp and more. You can also take a trek to Thermopolis to check out the Dinosaur Museum and the Hot Springs. Or take a drive over to the Dinosaur Dig in Bighorn County! Located on the Chief Joseph Highway on your way to the Beartooth Pass. Thermopolis WY is located about 84 miles from Cody. The World`s Largest Mineral Hot Springs and a Dinosaur Museum! Heading up the North Fork out of Cody is a beautiful scenic drive with great views and most of the time lots of wildlife. This road not only takes you to Yellowstone but also takes you to Wapiti. The location is named after the Cree Indian word for elk. There is dining options, and other activities nearby. Keep an eye out for the wildlife!If looking for somewhere to do laundry check in with the Yellowstone Cut Throat Guest Ranch and also Yellowstone Valley Inn.